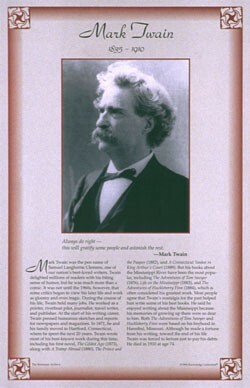 This unique educational poster features a photo of the great 19th century American writer Mark Twain, as well as a quote, and concise biographical text summarizing his life and career. Mark Twain was in his time, and remains today, one of the best-loved American writers. He delighted readers with his biting wit and sense of humor, but his work contained deep layers of meaning. Some consider "The Adventures of Huckleberry Finn" to be one of the greatest American novels ever written. 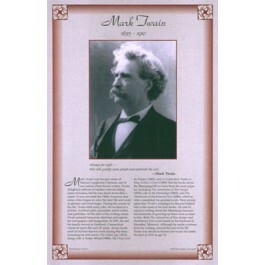 This poster is a great way to introduce students to this incomparable writer, humorist, and thinker.